No need to wait for a special occasion for cheesecake. 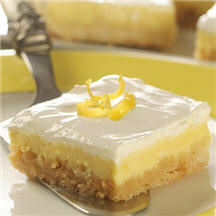 Enjoy these creamy lemon bars tonight. Combine flour and powdered sugar in medium bowl. Cut in butter with pastry blender or two knives until crumbly. Press onto bottom and 1-inch up sides of 13x9x2-inch baking pan. Bake for 25 minutes. Place cream cheese, eggs, evaporated milk, granulated sugar, flour, lemon juice, lemon peel and food coloring in blender container; cover. Blend until smooth. Pour into partially baked crust. Bake for additional 15 minutes or until set. Spread sour cream over top; refrigerate. Cut into bars. Garnish as desired.